• E-commerce grows rapidly in BRICS due to improvement of internet infrastructure and widespread adoption of smart phones. E-commerce has emerged as the new growth engine and opened up a historical opportunity for economic and social development in those countries. • In 2016, BRICS had 1,460 million internet users and 720 million online shoppers, consisting of 42.7% and 47.2% of the global total respectively. Online retail sales of BRICS increased to $876.1 billion, accounting for 47% of global online retail sales. In particular, BRICS’s share of cross-border online retail sales rose to 23%, reaching $92 billion. • By 2022, the number of online shoppers in BRICS is expected to reach 1,350 million, accounting for 61% of the global online shoppers. 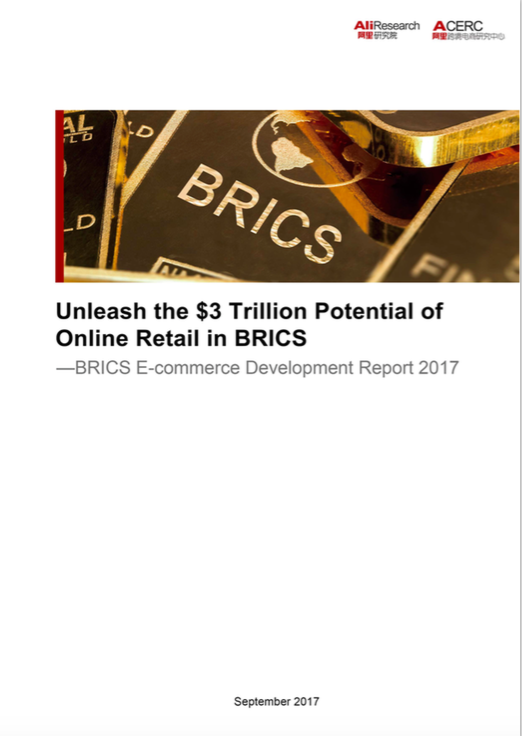 BRICS’s online retail sales will rise to $3 trillion, contributing 59% of the world total; in particular, BRICS will consist of 41% of global cross-border online retail with the sales climbing to $553.6 billion. • In order to take full advantage of the historic opportunity, BRICS should continue to improve domestic policy and business environments, which greatly facilitates digital transformation and economic upgrading. Especially, new administration approaches and service capabilities are required to accommodate new technologies and new business models. Meanwhile, BRICS should enhance dialogues and coordination on e-commerce policies in multilateral trade systems, regional trade arrangements and bilateral mechanisms to facilitate mutually beneficial opening, exchange and cooperation in e-commerce related industries and provide a new driver for BRICS economic and trade cooperation. • eWTP (Electronic World Trade Platform) initiative, proposed by Jack Ma, Executive Chairman of Alibaba Group, is designed to facilitate development of e-commerce and digital economy around the globe, incubate global trade rules fitting the internet era, and help MSMEs and developing countries. It’s hoped that in the years to come, the business communities of BRICS could further enhance communication and cooperation in the field of advancing eWTP Initiative, strengthening e-commerce cooperation, promoting digital economy infrastructure, and consequently make substantial contributions to realizing the inclusive growth for all people of BRICS and the whole world.